Russia and Turkey plan to give more time for the implementation of their de-escalation deal in the Syrian province of Idlib, a "great relief" for 3 million civilians in the area, UN humanitarian adviser Jan Egeland told reporters on Thursday. But there were still "a million unanswered questions" about how the deal would work, and what would happen if groups designated as terrorists refused to lay down their weapons. 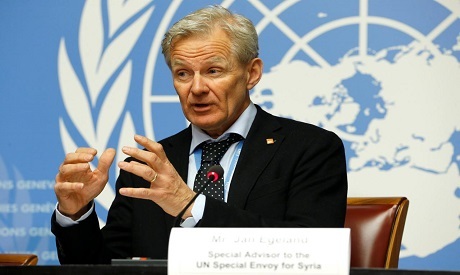 Speaking after a regular Syria humanitarian meeting in Geneva, Egeland said Syria's ally Russia had confirmed that Damascus had scrapped a "very concerning" law allowing the expropriation of land and property from refugees. Idlib and adjacent areas are the last stronghold of rebels who rose up against President Bashar al-Assad in 2011, and the UN has warned that a battle to restore Assad's control over the zone could be the worst of the seven-year-old war. Turkey and Russia's deal set up a buffer zone running 15-20 km (9-13 miles) deep into rebel territory that originally had to be free of heavy weapons and militants by Monday. "There will be more time for diplomacy," Egeland said. "I was heartened to hear both Russia and Turkey say they are optimistic, they can achieve much more through negotiations, and they are generally very positive on the implementation of this deal which is giving a relief, a pause in fighting, to Idlib." In the east, however, fighting was raging around several villages inhabited by 15,000 people, including Islamic State fighters and their families, who were under attack by Syrian government and Kurdish forces, and 7,000 civilians had fled. "There will be another team," he said. "The job is not even half done."